Subtlety sweet with a soft outside and a crunchy inside. Heat oven and baking sheet to 425°F. Remove baking sheet once oven is hot. Spread carrots on sheet and dot with butter pieces. Place is oven and bake for 15 minutes. 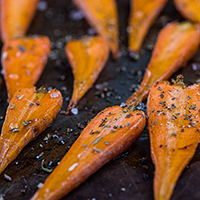 Remove carrots, stir, and sprinkle brown sugar on top. Return to oven for another 15 to 20 minutes. Stir once during the second cooking time.